Good (and rather rare) registration of great performance. Signed copies are true collectors items. Recorded 13 February 1975 at Leeds University (sleeve says October). Album originally released in 1975 in limited edition (often numbered and signed) of 10.000 copies, sold for 2 pound 50 and 50p for postage and packing. Records had white labels instead of the pink rim or blue rim palm tree labels that Island normally would have used. Re-release in June 1987 on Cacophony label. This release has a different label. And while the original back cover is empty (except for the text 'ILPS 9343' and 'Limited Edition Number:'), this back cover carries some text and the track listing. Extended CD with rather bad sounding bonus tracks* in 1998 (with a misspelling Bless This Weather on the cover). 4 November 2002 Turning Point Records tuned in on the HQ vinyl vogue by releasing a double vinyl album containing the original Live at Leeds on four sides of 180 grams vinyl. The sleeve was a triple folding one containing two albums, a 12 page booklet with a biography and discography by John Hillarby and a good deal of often unreleased photo material. Stories were roughly based on the Sunshine Boys Tour program. The whole thing was a bit of a strange operation as not the original master tapes were used; the Voiceprint CD master served as source material (fortunately without the bonus tracks). Also the vinyl was pressed in Italy and people who contributed to the project never got paid. This being said it is still a nice item, especially for people who love turning sides on their record player. Retail price was about 15 pounds. So how does it all sound? After making some comparisons on a high-end sound system (two single ended tube amps), it is safe for me to say that the original vinyl pressing from 1975 carries the best sound quality. The CD release from 1992 also sounds OK but has limitations because of its digital nature: there is less depth in the recording, bass sounds less lively, cymbals become rather distant and flat. The Voiceprint CD from 1998 sounds the same, making it likely they simply copied the original CD instead of resampling the original master tape on state of the art equipment. The heavy vinyl release was made from the Voiceprint CD and unfortunately the sound does not get any better than the CD quality from 1992. Also the pressing sounds a bit crackly. In general however, Live At Leeds is not meant for jawdropping hifi demonstration purposes. Instruments tend to sound subtle and often a bit remote. But when things add up, it is a very musical record that really does justice to John's talent and that of his companions. John took the album to Island first but they refused it. He then decided to record, produce, design and market the record himself. (The word 'design' requires some irony as John more or less copied the sleeve of The Who's album with the same name.) Apparently, according to Street Life magazine, "Martyn wanted the cover and centre label to be just plain, unsullied white, with no info. This demand -a reaction on Martyn's part to having recently lost control of his albums' cover design- has not met with widespread approval." He got Island to order 10.000 copies at EMI and though some of them were distributed through regular channels, most of them were sold from his Hastings home (10 Coburg Place, The Old Town, Hastings, Sussex). The first pressing sold out in two months' time, as New Musical Express carried the following announcement on November 8th: "Live at Leeds has now sold out its limited edition of 10,000 copies. As a result no further orders can be taken." The ad from Melody Maker (13 September 1975) is interesting because John could have written the (rather ironical) text himself. However, Street Life claimed in the same period: "Martyn wasn't responsible for the advert slang and was outraged to see that a coupon application had been added." Four September 1975 tour dates are printed on the bottom. 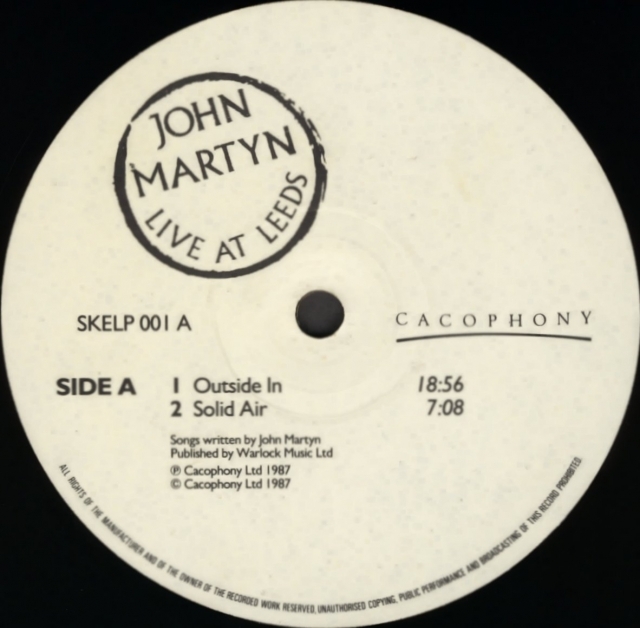 Also on the order form the record is called 'John Martyn Live'. This implies the title Live At Leeds had not been decided upon yet. Lee Barry wrote that the original working title was Ring Side Seat; there was a photo shoot where John and Danny Thompson posed as boxers in a ring (at the Thomas A' Becket boxing gym, Old Kent Road, London). "I sold them all, it was very profitable for me. I mean every morning for months I woke up and there was another couple of thousand quid lying on the floor. It was wonderful. It was also a nightmare. I never worked so hard in my life, opening all those letters, having to personally reply to every one of them, making sure all the right letters went into all the right envelopes. Dear Frederick, or was it Cecil? Woburn... But I learned a lot from that... But it was very effective, I was the first of the record independents." "It was great. Terribly hard work, though... I would never do it again. The only way to do it would be to hire people to take care of everything; it was just too difficult for me and Bev. It didn't help matters either when there was a three week delay between the time EMI said they'd deliver the albums and the time they actually arrived. I was on tour when it came out, so Bev had to handle most of the work on her own". The unannounced and checkered visitors also put a strain on the household. "You can't be answering your door to Spaniards every day,' John said, shortly before he moved. 'Total freaks turning up at your door with their sleeping bags. 'Hi man, always dug your music. Any chance of a crash?'." On the other hand, Street Life magazine wrote "The home distribution idea has at least brought Martyn substantial encouragement in the form of letters accompanying their orders, many profusely adoring." So how many copies did John sign himself? "It took me a great deal of time and effort to do it. Because I foolishly undertook to sign every copy, and we made ten thousand copies. And writing your name ten thousand times is not fun. It sounds easy but I promise you, after three or four thousand times you get a little tired." "Sorry it's late, E.M.I. 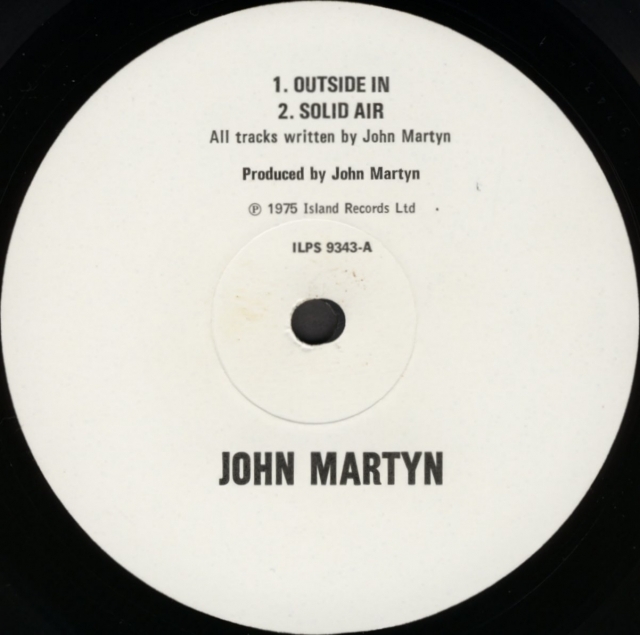 fucked the 1st pressing up - Godblessyer, John Martyn." The first pressing was faulty, and in the mold numbers, the '3' next to the B-side might be an indication that this was the one causing the problems. Number 0027 stated "Sorry to be so long - John and Beverley Martyn". The same text was used on some unnumbered items. The text is funny as it is correct and also a song title from The Road To Ruin. Numbers 11-20 were first offered to Black Sedan Records in Manchester. Number 16 and nr 17 just had John's signature on it. Number 101: "Cheers Nigel ooops!/ Take Care/ John Martyn". The 'oops' was because when signing this copy, JM has started to spell the name incorrectly. Next to 101, John also wrote "(IMAGINE THAT!)". The record was mailed 8 October 1975. A special mention deserves an unnumbered copy with the text: 'The Observers album of British Nutters | Godblessyer Steve | John Martyn'. As late as 2018 it was discovered that the copy was given by John to Stephen Turner, who worked as an editor for the Hastings & St Leonards Observer. Which explains for both the 'Steve' and the 'Observer'. Steve had a short interview at the Hastings home shortly after the concert of 9th January 1976 at the local Carlisle Hotel. Later on Steve gave his copy to photographer Tim Dickeson. 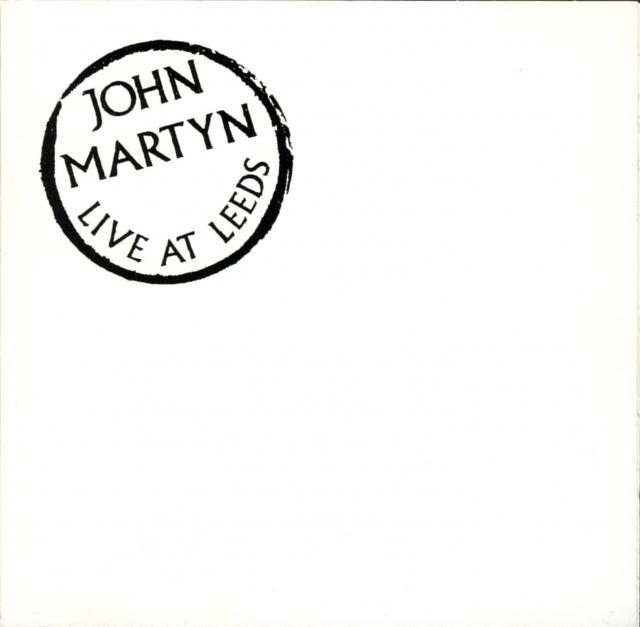 JOHN MARTYN "LIVE AT LEEDS"
LIVE AT LEEDS wurde bereits 1975 produziert und erschien Anfang 1976 auf John Martyns eigenem Label. Er nahm diese LP auf, produzierte sie und vertrieb sie selbst. "Manchmal klingelten die Leute an meiner Haustür und verlangten ein Exemplar. Es war wondervoll, ich wachte morgens auf und wieder lagen einige tausend Bestellungen in meinem Briefkasten. Es war eine riesige Erfahrung, alle diese Anfragen persönlich zu beantworten, Briefe einzutüten und Pakete zu packen." Anläßlich der erneuten Zusammenarbeit mit Bassist Danny Thompson entschloß sich John, diese inzwischen total vergriffene Langspielplatte bei "pläne" neu zu veröffentlichen. LIVE AT LEEDS hat auch 1987 nichts von seiner Kraft und seinem Ausdruck verloren. John Martyn (Gesang, Gitarre), Danny Thompson (Kontrabaß), John Stevens (Schlagzeug) beweisen, wie zeitlos schön Musik sein kann, fern ab vom "big business" der Charts. 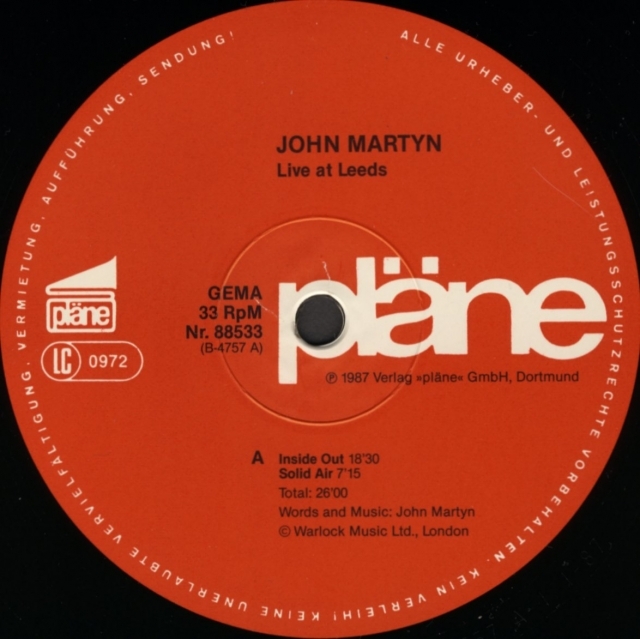 So the claim is that John himself took the decision to rerelease Live At Leeds in Germany on occasion of the new musical co-operation with Danny Thompson. This must have been the mid-1986 reunion tour that also gave us the Germany 1986 tape released as Collectors Item. As late as July 2004 Uncut editor Allan Jones published some colourful memories of the evening Live At Leeds was recorded. Taken from his diaries, he claimed. The story is to be consumed with a pinch of salt, presumably.